One of my favorite things about long distance running is eating the night before a race. This is one of the only times in life that I eat without thinking about carbs (other than Thanksgiving). When Gabe and I signed up for the First Watch Sarasota Half Marathon, we inquired around to find the best carb loading restaurant in town. Chef Judi Gallagher quickly suggested we visit Flavio's Brick Oven Pizza bar, the newly expanded 20 year old restaurant in Siesta Key formally known as Bella Roma Ristorante. We started off the evening with a nice bottle of Marina Cvetic Montepulciano d'Abruzzo. This rich red wine paired perfectly with all the dishes we feasted on. Along with our wonderful bottle of wine, we received a basket of fresh baked bread with a garlic oil to dip in. The oil had chunks of garlic in it and was perfect! We quickly ordered an appetizer for the table once we heard the special, housemade burrata with Prosciutto. Gabe had never tried burrata before this moment. Burrata is one of my weaknesses and I order it every time I see it on a menu yet Gabe has never tried it before. He freaked out over it and although he was saving room for our insanely large dinner, he finished off the plate. Since Flavio's just rebranded with the brick oven from Italy, we couldn't visit without trying the pizza. This pizza was truly unlike anything I have ever tasted. 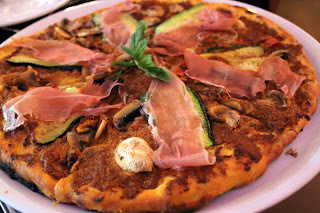 It had a homemade sundried pesto sauce, mushrooms, zucchini and prosciutto. The crust was beyond - very crispy and thin while holding up to the sauce on the pizza. I seriously could eat this pizza every single day. Thank goodness there are three of us dining because we have so much food coming out after that pizza made it's delicious appearance. Our first entree made it's way out and it was the special of the night - a Pasta Duo with (drum roll please) Lobster Ravioli Alla Vodka. YES! Served along with that was Linguine with Tuna arrabbiata sauce. The Lobster Ravioli was one of my favorite parts of the meal. Flavio's Vodka Sauce was very good and I know my Vodka Sauce. The linguine with a Tuna wasn't my favorite of the evening although the arrabbiata sauce was excellent. 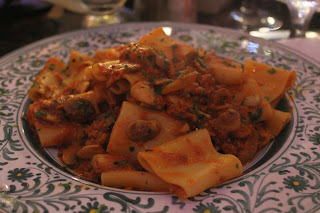 My favorite pasta dish of the night was the Paccheri with a meat sauce and mushroom sauce. This sauce was so rich and meaty. The fresh pasta paired perfectly with it. Also, check out the size of that noodle! It was truly amazing. 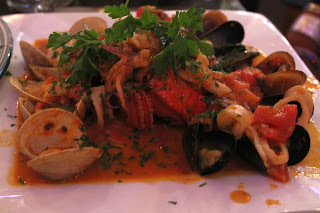 Finally, the Zuppa di Pesce - Mussels,clams shrimp and lobster tail in a tomato garlic broth served with bruschetta. Everything from the lobster to the clams was perfect in this dish. The sauce had the perfect amount of flavor, not taking away from the seafood while still giving it that Italian essence. I was super excited to see the Lobster tail in the mix! As the three of us sat there pained over how full we were, Flavio's wife came over and insisted we try her homemade desserts. You could tell she takes a great pride in her pie's so we happily agreed. 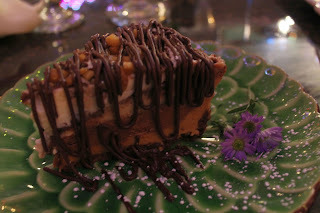 Her special Peanut Butter Mouse Pie was light, airy and perfect. It didn't have an overkill of peanut butter, which is what I usually find with PB pies. It was a delicious dessert. She also brought out her homemade apple pie with blueberries. I was so full at this point that I could only handle one bite. It was very good though. The fresh cream on top was a nice touch and different from the typical apple pie a-la-mode. We ended the evening with a nightcap of homemade limencello. I tried the cherry while Gabe tried the traditional lemon. Another first for Mr. Copello - I didn't know he had never tried limencello prior to this night. We have a new limoncello fan in the family. I ordered a decaff cappuccino before heading back to the hotel. 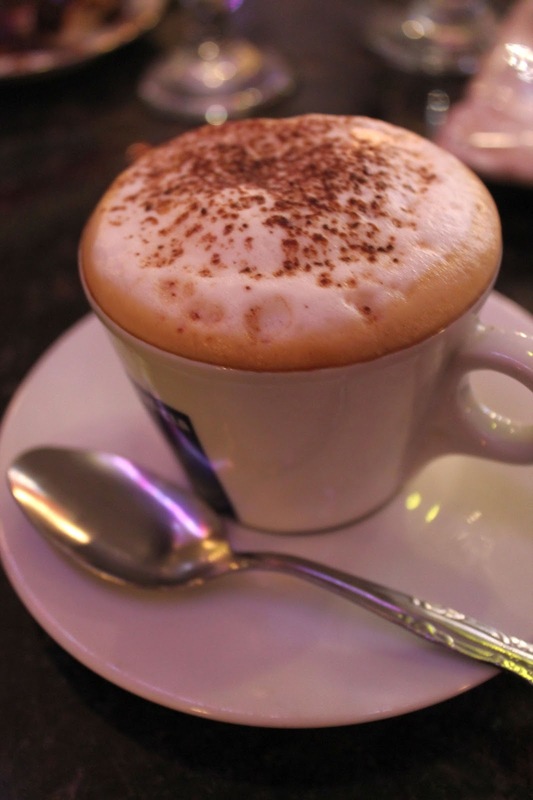 It had a perfect froth which I wish I could recreate. 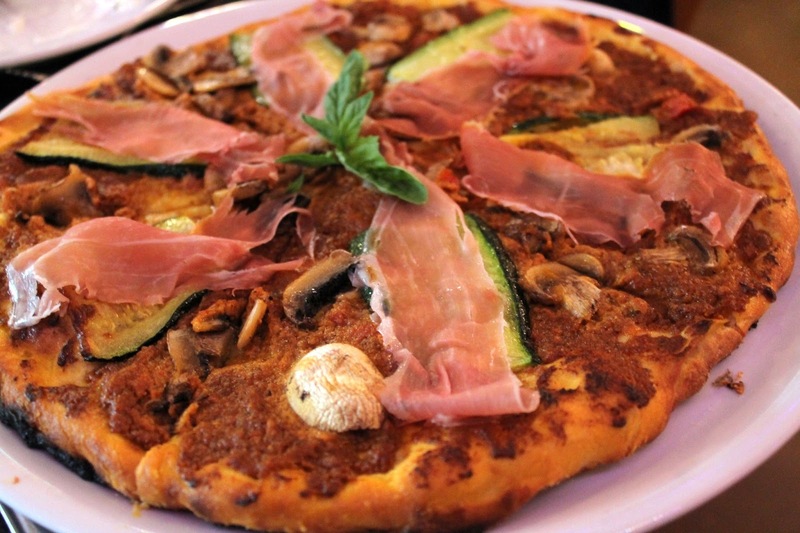 Flavio's Brick Oven bar was a romantic and inviting Italian restaurant. It had so much character and it is very easy to see how locals could easily fall in love with this restaurant. 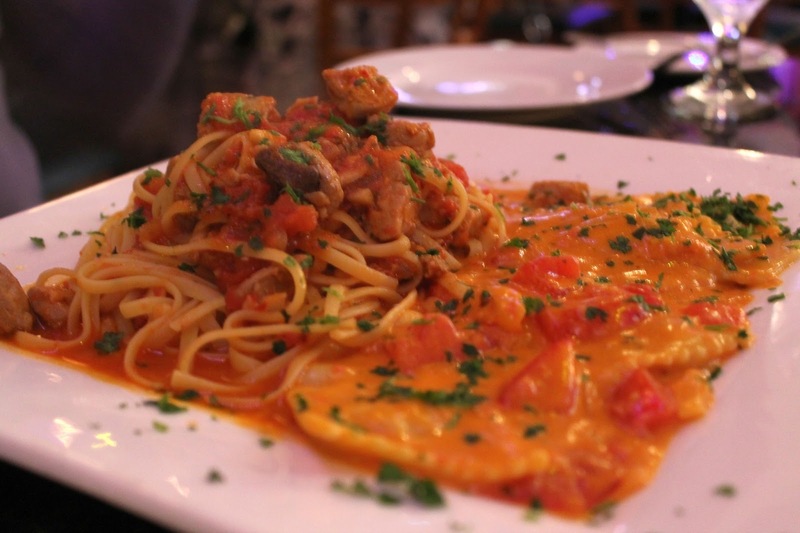 Upon walking in the doors, you knew that you were in for a true Italian meal. The family owned business proved that to us very quickly and I would return in an instant for another amazing meal. Those pastas look....INCREDIBLE! "I want more, I want more!" Mmmm - looks absolutely delicious! Burrata with prosciutto...want want want! I agree with Lauren on the pastas...wow. You first had me with that duo. Then, I saw the paccheri. Wow. Clearly they make that pasta in house. It's like twice as wide as pappardelle. Amazing. That pizza too...killer. 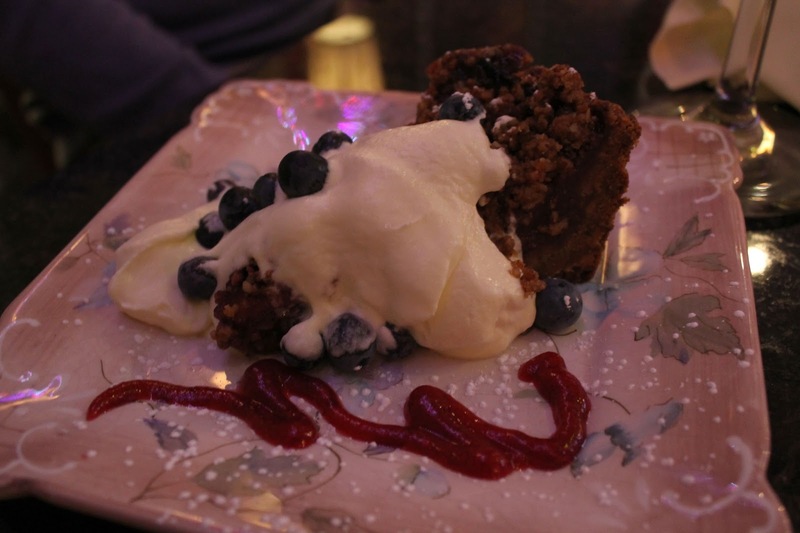 Oh and blueberries with apple pie? Love that combo!!! Great job with baking me drool! Yet another reason to go down to SRQ more often!! !